Working closely with biologists and researchers, and often taking multi-day expeditions just to see her subjects in person, Sussman photographed 30 species of elders, ranging from a multi-acre aspen grove to a small, predatory fungus. Along the way, Sussman has reported on her progress in a TED talk, kept a delightful blog, and, most recently, been named a Guggenheim Fellow. 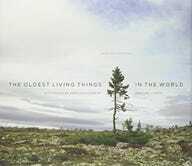 Her project has now been published as The Oldest Living Things in the World, a gorgeous book of stunning portraits which almost seem to capture the wise, wizened personalities of these scraggy pines, rippling sea grasses, and otherworldly mosses. Accompanying the photo are Sussman's essays, which serve as both a scientific explainer and a captivating travelogue, transporting the reader to often freakishly remote locations on all seven continents. The book and its subjects are at once inspiring and terrifying—a testament to the resiliency of nature, of course, but also a reminder of its fragility. During her research, some of Sussman's subjects died due to human intervention, like a bald cypress named The Senator, which was killed in a fire started by meth addicts, and is marked in the book as "deceased." One species of rare eucalyptus in Australia is not named, nor its location revealed, in order to protect it from those with bad intentions. I asked Sussman about the quest to document age, how to define something as "old," and the how thinking about what she calls "deep time" has influenced her own life. Gizmodo: Your first encounter with an "old thing" was with a 7,000-year-old Japanese tree (which you said you discovered later is really not all that old). Tell me about that experience and how it made you realize you needed to embark upon this project. Rachel Sussman: This project does indeed have its roots—is it too soon for puns?—in a journey I'd made in 2004 to the remote Japanese island of Yaku Shima in search of an ancient tree. I had been traveling in Japan on my own, and was having a somewhat uneasy time, grappling with what real constitutes old age while considering both the temples and Kinkos of Kyoto. I considered cutting my trip short, but instead packed up my things and went in the opposite direction—towards that old tree—and ended up having one of the most richly rewarding travel experiences of my life. I didn't have an epiphany standing in front of the tree (which took a committment of a two-day hike to visit), but clearly it had gotten under my skin. Over the next year I continued to think about it, as well as my general feeling of wanting to make an art and science project also informed by philosophy. One evening, while having dinner at a Thai restaurant in SoHo with some friends, while relaying stories of the travel adventure to Jomon Sugi, the idea just hit me: The Oldest Living Things in the World. I definitely did not know what I was getting myself into! Partially in terms of the scope, but also that I wasn't sure how I could do justice to this idea of finding and photographing them. Eventually I realized that the best way to share the idea was to help encourage an anthropomorphic connection to the organisms as individuals. So instead of making landscapes that happened to contain old lifeforms, I approached the photographs as portraits of individual, ancient survivors. You've now been to every continent and racked up a ton of frequent flyer miles. What's the most extreme journey you had to take and what did you photograph? I did rack up a lot of frequent flier miles... but they all went out the door again just all as soon as I had enough to cash in. You have to be scrappy when your itinerary involves travel to every continent! Perhaps I've had more than my fair share of adventures along the way. Some of my favorite trips where to Namibia and Antarctica, which included the jaw-droppingly beautiful South Georgia island out in the Antarctic Convergence, not to mention following in Ernest Shackelton's footsteps. But the title of "most extreme journey" hands down goes to my experience in Greenland, where I had my own personal 127 Hours moment lost along out on remote fjord. In a nutshell, I was was where I was supposed to be, but the people I was supposed to meet, some Danish archeologists studying Norse ruins with the help of the same lichens I was there to photograph, were nowhere to be found. They had all the supplies. And the satellite phone. All in, I wasn't lost for more than eight hours, but it was a humbling experience to truly be cut off from the rest of humanity. The story about that moment in the book is really beautiful, and I had to think very hard about when or if I'd ever felt that alone. I cursed myself for not being better prepared. But I also gained some deep perspective through that experience, and somehow related to my ancient subjects leading solitary lives for thousands of years out in the middle of nowhere. Of course the primary difference is, they'd generally be better off if they weren't found. I think what I enjoy the most about this project is that it has such specific parameters. "Continuously living" is one rule. Then you talk about setting up the 2000-year-mark as the "young" end. From the outset, I selected continuously living organisms 2,000 years old and older—"year zero" and back—as the primary parameter for inclusion. I wanted to draw attention to the arbitrariness of human timekeeping. I mean, why is 2014 right now instead of 4,500,002,014? Exactly! You also decided to allow clonal organisms. Clonal organisms are things that propagate, for instance, through vegetative growth or binary fission, are not reproducing sexually, and do not have any new outside genetic material being introduced. For purposes of this project, that qualified them for inclusion as individuals. It's fascinating the lengths different life forms will go to survive, and I wanted to include organisms that expand our thinking of what it means to be alive, and persevere against the odds. Some of the things you photographed were not actually discovered when you started the project, right? Indeed, several of my subjects were discovered just in the years that I've been at work on the project, and a very large percentage of the group were discovered in the past 25 or 30 years. Not only is the science for how we date these things always changing, but the science to find them is also progressing. There is so much we don't know! It was really eye-opening once I started to dig around in this area to learn just how much we still don't know. In fact, there is not even an area of study in the sciences that looks at longevity across species—it's considered too broad. I love the idea of a field of study just about the world's oldest things. It seems like this would be extremely useful for everything from microbiology to architecture to even our own Singularity-type existence—how do the things that have been around the longest survive? Yes! Looking across disciplines is a great way to approach life—in fact, we all do it naturally. It sounds fancier than it really is, but we're all transdisciplinary, aren't we? No one is interested in only one thing, and everyone has the capability to bring fresh thinking to old problems, or to look at things from new angles. Having rules can be important, but so is breaking them. That can be as simple as taking a quarter turn and looking at something from a different angle, or not being afraid to mix things together that don't natural belong. On another note, I'm hard pressed to think of a single instance where engaging in long-term thinking wouldn't have a positive long term net effect. Whether its personal question, or a larger societal one, looking back in time at past cause-and-effect, and projecting down the road to possible outcomes is a wonderful—not to mention responsible—way to engage with causes and consequences of our choices beyond immediate gratification. Speaking of mortality, climate change is the ultimate emergency in slow motion: our long-term thinking, as a species, is woefully lacking. A little more long-term thinking now could mean the difference of life and death on a scale that few of us can imagine. Posidonia Oceania Sea Grass #0910-0753 (100,000 years old, Balearic Islands, Spain) At 100,000 years old, the Posidonia sea grass meadow was first taking root at the same time some of our earliest ancestors were creating the first known "art studio" in South Africa. It lives in the UNESCO-protected waterway between the islands of Ibiza and Formentera. Speaking of scale, you talk a lot about the cultural measurement of time, as well as "deep time." Can you explain a little about these concepts? I find it remarkable that we ever got to a consensus as to what year it was. I'd love to know more about how that transpired. I mean, we had the Jewish, Chinese, and Buddhist calendars all active 2,000 years ago, just to name a few. Not to mention how some of us got a little kick out of the Mayan calendar recently predicting the end of the world. While I find all of that culturally fascinating, it helps underscore how arbitrary human timekeeping really is. Through this work I wanted to look back further back into time than the relatively shallow, anthropocentric way we're used to. First into geologic time, and then even further back into cosmic time. I was really surprised and thrilled to learn that two of my subjects in particular have such connections, albeit in different ways. First, the stromatolites, which are fascinating in that they are both biologic and geologic, are connected to the dawn of all life on Earth. Made up of cyanobacteria and non-living sediments, the first stromatolites began the incomprehensible job of oxygenating the planet through photosynthesis 3.5 billion years ago. It took around a billion years. I photographed the oldest living stromatolites, which are between 2,000 and 3,000 years old, living in Western Australia. Not far beyond the beach is an meteor impact site. It could be coincidence—but maybe not! Perhaps the first cyanobacteria piggybacked their way to Earth on an astroid. Another favorite astrobiology story of mine has to do with another of my subjects, the so-called map lichens in Greenland. Some lichens of the same species were taken up into space and exposed to outer space conditions for ten days. They returned to Earth completely intact and unharmed. How has the project changed your own perception of time, or even your own sense of pending mortality? It's taken a lot of time to really take in deep time! While I've always found the subject compelling, it wasn't until I was years into the project that I got more comfortable there. Even still, I'm sure I've only just scratched the surface. In fact, that's why in my next project I plan to take on the subject of deeper time and deep space. But looking at deep time isn't something just for scientists to study; there are wonderful lessons and connections and analogies to be drawn in our everyday lives. I think of deep time as something akin to deep water: it's really interesting down there, but we're constantly being drawn back up to the surface. While it's only natural (or only human), to be caught up in our wants and needs of the moment, taking a longer view has certainly helped me think about things differently. On a personal level, it can be wonderful to be reminded that things change—that balance is an active process, and that we can chose longer scales to measure ourselves against. Every moment matters, and yet it is also part of continuum so much larger than we tend to consider. This is also why long-term thinking is so directly tied to climate change and preservation: it's hard to fathom that any individual choices we could make really could make that much of a difference. But collectively, they absolutely do.